For most of our married life, John and I have spent whatever we’ve had in the bank, living check to check. Some years were very lean, and some years were abundant. But it’s been in the last few years that we’ve been better at savings … and aren’t we glad. Now we can look to expand our family with excitement, not huge worries about costs. But that’s just one benefit. Helps guard against credit debt. Helps to teach kids the value of money. Reminds us that we are in control of our money. Allows us to share our abundance and give to others. Having a savings account is a buffer than helps you to guard against credit card debt. When you have money put aside, you can celebrate life’s events with a joyful heart, and without the worries of having to scale back on family celebrations. You are also prepared when those surprise expenses come up like medical bills or new tires. For children (well, sometimes adults too) the concept of money is vague. To help children understand better, show them an example of your family budget with savings, giving, and expenses laid out. 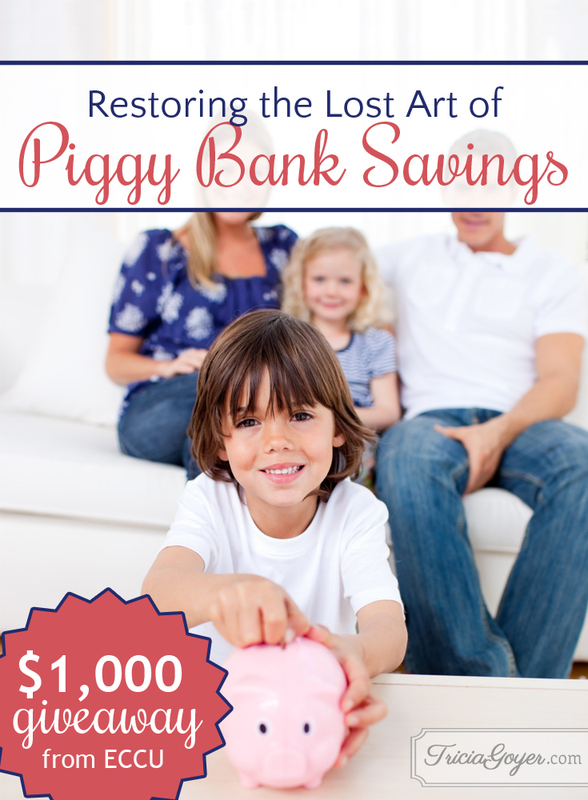 Let your kids watch you as you write checks or put money into your savings account. Provide your children a small, weekly allowance and help them to do the same with their money. When we spend using credit cards, money slips away every month with fees. When we have a budget and a savings account, we can happily decide between our wants, our needs, and how to spend and give. Instead of $50 or $100 (or more) going to interest every month, we can give to worthy organizations that supporting teenage moms or who fight against human trafficking around the world. We decide where every penny goes, and who it can help. Having a savings account prepares us for life’s challenges, and life’s celebrations, but it also helps us to give with compassion. There have been times I’ve wanted to give to causes, but I’ve had little to give. When we save well, we can give well. Most people already know the benefits of credit unions, such as customer ownership, fewer fees and higher savings rates. An added benefit is affinity-based banking—the intersection of faith and financial planning. These are financial institutions that offer business and consumer banking services while also investing profits in social causes. Using a credit union like this doubles your giving. You not only have more to give with few fees and higher savings rates, the credit union is using their profits to give to worthy causes, too! 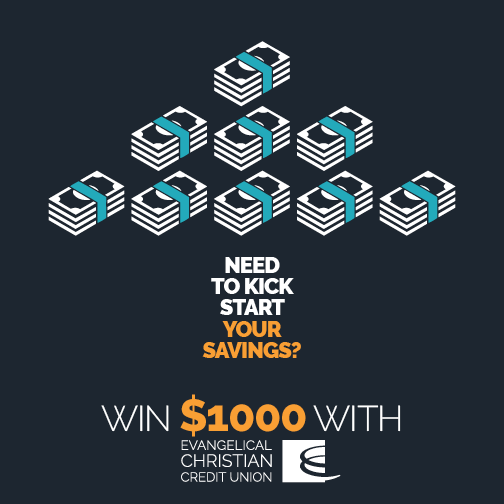 “SAVE WITH ECCU” $1,000 GIVEAWAY! Enter below for a chance to win $1,000. The contest runs from March 5 – April 10, 2015. The qualified winner must open an ECCU Money Market Savings account where the $1,000 will be deposited. Click here for official rules. I have an interesting savings program I started years ago. I save pocket change. I have a bank that counts separates the change and puts it in the correct wrappers .I saved this way for years so we could do something nice when we retired. Retirement came and I still was saving and waiting for my husband to retire. At 72 he retired and a year later we took the vacation we wanted and you might say that we paid for it all with pocket change and there’s still money in our savings account. Who knows? Maybe well live long enough to take another trip on pocket change. Tricia, I knew you were looking at adopting multiple kids again! I just had one of those feelings. So happy for you guys! And, of course, I can’t wait to hear more news and see pictures when they become available. I’ve been dropping a few hints, haven’t I?! We are currently saving to purchase a farm/home in full. Our children went through losing our last house due to debt and now they are witnessing the blessing of saving up for what you want/need. Hopefully this will teach them a life long lesson in sacrifice and patience. We know what it is like to get into debt because of a lack of savings, and it was not easy to get out. Good post! Having a savings means that you are spending less than you earn . . . which, to me, is the necessary foundation for a successful budget. Needing to build my emergency fund, thank you. When our kids get money for birthdays or Christmas, they must tithe 10% (we let them chose between church and a couple of missionaries), they get to keep dollars that equal their age (ie. If Clare was 9, she got to keep $9 to spend) the balance went into their savings account. We started when our kids were young so they just accepted this as what our family does. My husband and I are working Dave Ramsey’s Baby Steps to become debt-free. My kids do chores for money and are learning to give, save and spend. I’m trying to reverse the money situation that has been passed down with my family and teach my daughter about saving up for things instead of buying non-essentials on credit and paying interest rather that earing interest on saving. It’s hard sometimese to wait, but, usually makes me feel so much better!! 🙂 So important to have a savings account!! I have tried to teach my kids how important saving is, and how all the material things don’t matter..to go and see the world and give back. I wish someone had told me about saving, and now I am very careful with spending ! I’d rather save, then go out to eat or buy items. What a great giveaway! We also just had our son announce his engagement and as fun as a trip abroad will be, his wedding will be in the same state. A little easier on the budget! credit card debt can wittle away at self esteem and happiness. We are working at rebuilding our savings in our family and living without credit cards. Our thoughts and prayers are going out to all those struggling and working forward to peaceful times without debt. I would say please don’t make the same mistakes that I did, always putting it off, thinking there was plenty of time. Wow, I didn’t know there was a credit union like this. Very cool!